Atlantis Office is devoted to helping you find your perfect Office Desk, this is why we have such a huge variety to choose from. 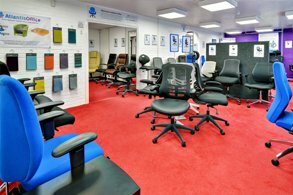 We have everything from straight office desks to ergonomic office desks to executive office desks. All of our office desks are thick, strong and reliable. Delivered to your front door our office desks are sure to make your work life that bit more enjoyable. After all you spend 8 hours a day at your office desk you will at least want to have one that suits your office needs and looks stylish. Choosing the right desk can be difficult as there are numerous factors to consider for example desktop thickness, width depth and height, colour, style amongst other features. Atlantis Office supply desks and office furniture in numerous ranges so all of these factors match allowing for a more aesthetically pleasing office environment. 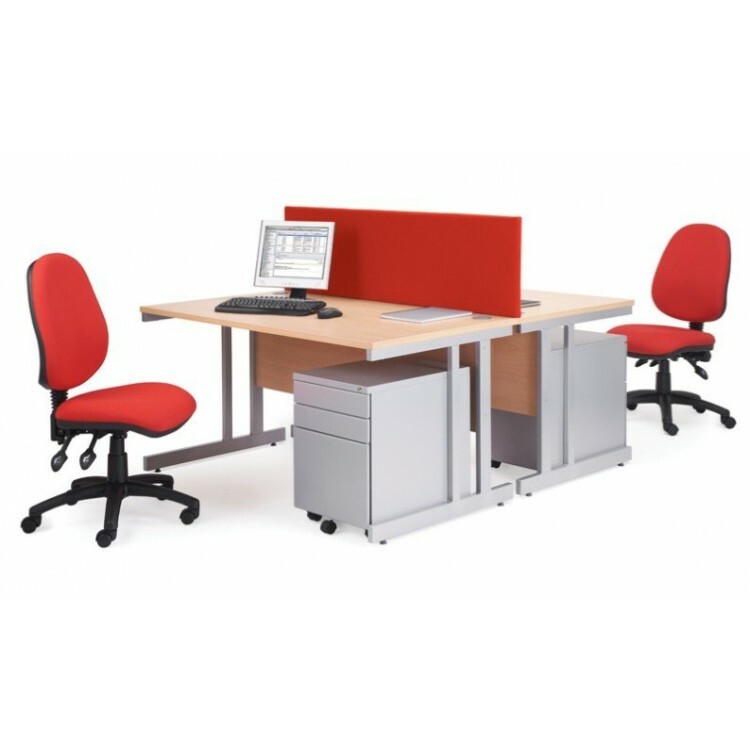 In addition to conventional Office Desks eg: Straight Office Desks and Corner Office Desks we can supply Bench Desking. 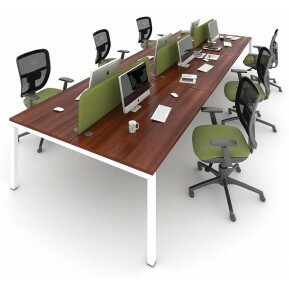 Bench Desking is a cost-effective way to maximise desk space within compromising floor space. For product enquiries and further information please phone 01206 586858 or click Here to send us an email. STOCK DUE APPROX. 1ST DECEMBER 2018The Rhodes is our simple yet stylish, walnut desk ideal for use i.. The Trestle White or Cinnamon Cherry Home Office Desk is suitable for any home office with.. The Arizona is our strong and sturdy desk finished in a light oak colour. It is a writing desk which..
Rayleigh is our stunning range of office desks, cupboards, filing cabinets, pedestals and more in a .. The Rayleigh 600mm Deep Two-Tone Panel End Straight Office Desks are available in a choice of 4 hea.. The Hastings French walnut effect desk is an ideal work space for any study or home office. Featurin.. The Rayleigh Cantilever Straight Office Desks are available in a choice of 5 width options (1000mm, .. The Rayleigh Panel End Straight Office Desks are available in a choice of 5 heat resistant mela.. The Rayleigh Two-Tone Panel End Straight Office Desks are available in a choice of 4 heat resistant.. The Industrial Style Oak Bench Desk is ideal for use in any home office, it has a minimalist, s.. The Industrial Style Smoked Oak Bench Desk is ideal for use in any home office, it has a minima..
Multi Store compartment office workstation. This desk is ideal for those who want to expand their wo.. The Maryland is our wooden white home office desk which offers you two storage cubbies as well .. The Workmode Panel End Rectangular Workstation is suitable for use in any office work space, it is a.. The Albion is our strong and sturdy light oak coloured workstation, ideal for use in the home office.. The Harlow Straight Office Desk is part of our new Harlow Desking range, it comes with an 8 ye.. The Albion is our traditional styled light oak workstation, ideal for use in the home office. It fea..
White modern office desktop features a stationery draw, rounded edges for your comfort and safety wi.. The Rayleigh Cantilever Wave Office Desks are available in a choice of 5 heat resistant melamin.. The Rayleigh Panel End Wave Office Desks are available in a choice of 5 heat resistant melamine.. The Rayleigh Two Tone Panel End Wave Office Desks are available in a choice of 4 heat resistant mela.. The Glacier Workstation is a modern, space saving, clear glass workstation with CPU, storage shelf a.. The Marymount is our white home office desk, ideal for studies and bedrooms alike. The desk features.. The Air desk is our black framed, smoked glass desk. The Air desk is designed to maximize space and.. The Lyndon French Walnut effect corner desk is perfect for computer work due to the amount of space .. The Rayleigh Cantilever Corner Office Desks are available in a choice of 5 heat resistant .. The Rayleigh Panel End Corner Office Desks are available in a choice of 5 heat resistant melami..  The Rayleigh Two-Tone Panel End Corner Office Desks are available in a choice of 4 heat resistant me.. The Dallas beech effect home office desk is our desk suitable for any environment such as in a home.. The Rayleigh Cable Managed Straight Office Desks are available in a choice of 5 heat resistant mela.. The San Diego home office desk is a smart, space saving desk ideal for any environment, featuring a..
Luxor High Gloss White Contemporary Workstation 40mm Thick desktop with curv..
Amazon Traditional Oak Effect Storage Workstation Compact Design 25mm Thick top and sides I.. The Cinnamon Cherry Corner Home Office Desk is suitable for any home office with its .. The Springfield offers a large work surface and manages to give a spacious, minimalistic look to any.. The Seattle is made from a light oak finish, complemented by a gloss white steel frame. This desk c.. The Rayleigh Cable Managed Straight Office Desks are available in a choice of 5 heat resis..